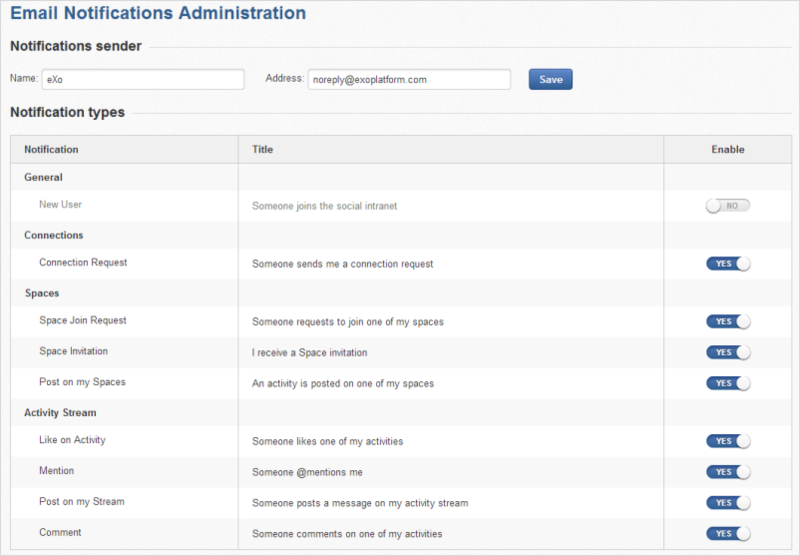 eXo Platform allows administrators to enable/disable notification plugins in the administrative interface. To do so, simply select → Portal → Email Notifications on the top administration bar. Name: Defines the display name of the email sender in the From field. Address: Defines the email address of the sender in the From field. It must be in the correct form, such as username@abc.com. Notification types: Enables or disables notification types globally. Notification: Name and categories of the notifications. Title: Title of the notification that will be shown in the email. Enable: Enables or disables sending the email notifications for each corresponding notification type. Once a notification type is disabled, it will disappear from the Notification Settings page of all users, and no new notification of this type is sent anymore.